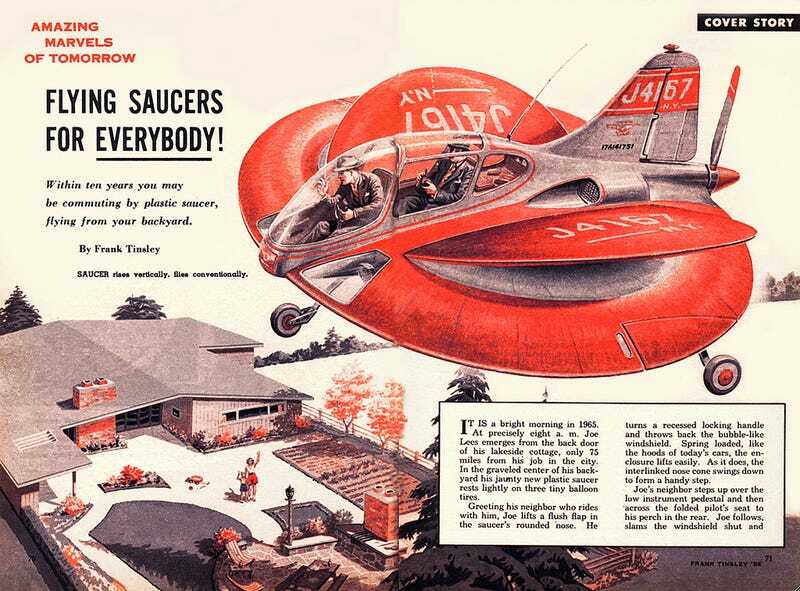 In a 1954 issue of Mechanix Illustrated, the magazine ran a wonderfully rosy piece titled "FLYING SAUCERS FOR EVERYBODY!" This short piece detailed how flying saucers would ameliorate arduous commutes in the far-out year of 1965. In line with his low cost philosophy, Nofi plans to have the top and bottom surfaces of his saucer stamped out on a press, using a plastic material reinforced by glass "flock." This technique, now successfully employed by small boat builders, will also be used on the servo-flaps, fuselage and other components. Cemented together with the internal gas tank spar, plumbing, etc., in place, the hollow wing will then be filled with a foamed plastic compound which cures into a rigid, air-filled sponge. This replaces expensive interior structure and converts the wing into an unsinkable life-ring for emergency water landings. Mass produced, the plastic saucer should cost no more than today's medium-priced cars. Could be that by 1965 you'll have one flying out of your backyard, too! It must be mentioned that modern experiments in domestic flying saucers have yet to live up to the past's woozy guarantees.